In this day and age where eating healthy has become so important, so many people do not like to eat fruit and vegetables. Even though they know it is good for them, they still prefer not to eat it. It can be very difficult getting used to a healthy lifestyle if all you are used to, is take away fast food. The first change is having to get home and cook. Immediately you loose about halve an hour of your “alone” time. What is important thought, is to think of this as an opportunity to spend this time with your children and husband/wife. Make it fun and interesting. Don’t loose your smile when you think that you will have to eat more fruits during the day and evening. There is a very easy solution that will be fun for the whole family. I think smoothies are one of the greatest inventions of our time. I know you get a lot of fruit juices and they are truly great, but some of the manufacturers do add a lot of sugar. Try to keep the sugar intake low by making your own. All you need is a blender, or smoothie maker and fruit. It is that simple. Try to play with the flavours. You can add whatever you like. If you do not try it, how will you know if you like it or not? My husband and I played around with some flavours the past weekend and I can tell you, it tasted great. You can get recipe books for how to make smoothies, but as I said, make it up as you go along. First we tried mixing banana, strawberries, kiwi fruit, grapes and plain yoghurt. It tasted LOVELY. This is not a sweet combination, so if you have a sweet tooth, maybe you should try our second recipe. The next one we tried, we used a mango, banana, yellow melon and yoghurt. This was ‘n sweeter option, but the banana was a little strong. Maybe you should try to use only halve a banana or replace it with some other fruit. We thought that next time we will try to replace it with a strawberry or two. Don’t know how it will taste, but we will definitely try. Making smoothies is a great time to spend together, learning to listen to each other and compromise on what fruit you want to try and just have GREAT fun! It will definitely tickle your laughing muscles, believe me. Go on, try to make your own smoothie and have a great time! Vitamins are vital for our every day life and the prevention of serious diseases like beriberi, scurvy, rickets and night blindness. Different organisms need different trace organic substances in their diet. Most mammals need the same vitamins as human, with only a few exceptions. One difference is the production of ascorbic acid. Animals synthesise this themselves, but humans can not do so. Plants can synthesise all the organic substances they need. Vitamins are essential to life as well as good health and it assists in the formation of hormones, blood cells and our nervous systems. It releases energy from food that has been digested and regulates our metabolism. Nothing happens without the assistance of vitamins in our bodies. If we do not have enough vitamins in our bodies, it can lead to a deficiency. Although organisms can survive for some time without vitamins, prolonged deficiency in any of the vitamins can lead to serious illness and can be potentially deadly. Sometimes the symptoms will not be seen until about a year later (deficiency in vitamin B12 for example), but with vitamins like B1, you will see the symptoms within a couple of weeks. There are 13 well-identified vitamins that our bodies need and they are divided into 2 groups. Vitamin A, D, E and K are all fat-soluble and can be stored in body fat. You do not need to take these vitamins every single day. Vitamin B complex (B1, B2, B3, B5, B6, B7, B9 and B12) and vitamin C are all water-soluble. They are not stored in the body, with the exception of vitamin B12 that is stored in the liver. These vitamins need to be taken every single day, because they are lost through urine. Vitamin D is the only vitamin that can be produced by our bodies, the rest need to be taken in through our diet. Something important you have to remember when eating foods that contain these vitamins we need, is that light, heat and processing of the food, are all enemies of vitamins and can destroy them. People that smoke and drink alcohol will need to take a vitamin supplement. When you consume a lot of alcohol, it dehydrates your body, preventing absorption of vitamins. Remember, all the water-soluble vitamins are lost through urine. Smokers have a deficiency specifically in vitamin C, but also others. Remember when you take a supplement, to take the fat-soluble vitamins before meals and the water-soluble vitamins after meals. Most importantly, always ask your doctor or pharmacist before you use any vitamin supplements. The food from South Africa is as diverse as the people that live there, influenced by many countries and cultures over the centuries. They have been able to combine all the great ingredients introduced to the country and making it their one, UNIQUE. Nothing tastes as great as South African food! Maybe I am just bias, but why not try it and judge for yourself. One big influence on the choice of food must be the two bordering oceans, the Atlantic and Indian. Seafood plays a very important role in any diet and can be enjoyed in a great variety of ways. Shell fish, rock lobster, crayfish, salt cod, kingklip and snoek (a pickled fish) are only a few of the great dishes enjoyed very often. They can be served with onions, lemon butter, chili peppers or a great curry. The crayfish are best served braised with onions and chilies and snoek must be barbecued. If you are looking for variety, you won’t be disappointed!South African cuisine caters for all and no matter what you prefer, you will find something on the menu to suit your taste. The food is both elegant and glows with simplicity. If you are looking for a main course and you are not a seafood lover, don’t worry. Look at the following choices and see what you like the look of. On the top of the menu is the great Afrikaner “hoenderpastei“, or chicken pie, inspired by the British pastries, but totally different and unique. This is a pastry pot, filled with chicken, sauce, bacon, green pepper and other “secret” ingredients with a pastry top, baked until light brown and crispy in a medium hot oven. If you are looking for lamb or beef, try the great bobotie from the Boere. This is a great dish, inspired by spices from the Malay slaves with onions, raisins and topped with a custard, comprising of egg and milk. This is usually served with yellow rice, banana, blatjang and coconut. Make sure to include a great vegetable side dish. Maybe the warm sunshine is too inviting and you are looking to spend your days outside! 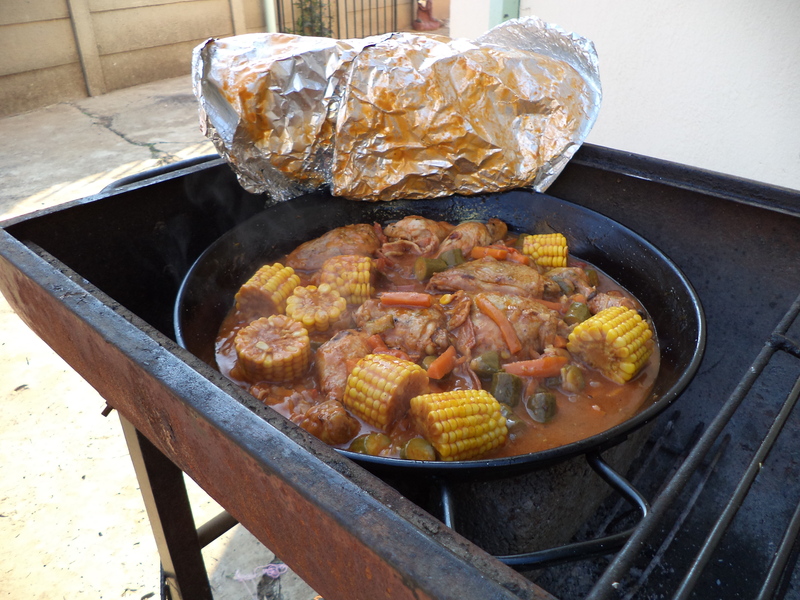 If you are, you should definitely try a potjiekos, also a Boer dish. Throwing all the ingredients in a cast iron pot, letting the vegetables cook in the meat’s sauces for many, many hours. You can bake a “potbrood” (a lovely bread) at the same time, by placing the dough in another cast iron pot over the coals. 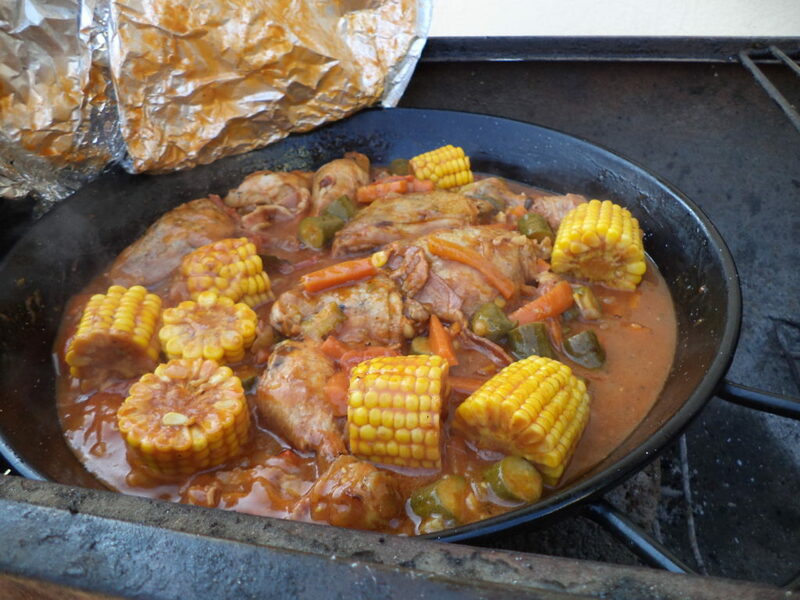 If the potjiekos is not for you, then why not try a braai (barbecue). Put some “boerewors” (a great seasoned sausage made from beef), steak, sosaties (marinated meat on skewers) and braaidroodjies (toasted sandwiches) on the fire outside in your backyard. This is the way to live! Serve with potato salad and away you go. Frikkadelle, basically small beef patties, are greatly seasoned and taste magnificent, being served with salads and vegetables. If you are looking for very warm and comfort food, try a bredie. The most popular is a tomato or water lily bredie or stew. This is an all in one stew comprising of vegetables and mutton, with the juices from both, flavouring each other. Bunny chow (curry stuffed in a hollow out loaf of bread) and curries have become very popular because of the Indian influence and you can buy sweet, mild or hot curries, mostly serve with atjar (pickles) and blatjang. Blatjang is chutney, and served with EVERYTHING. All you have to do is cook local fruits with garlic, chilly peppers and onions to mention just a few ingredients. Local vegetables and fruit play a very important role in the daily diet. Tomatoes, potatoes, cabbage, mealies, green beans, sweet potatoes, spinach and pumpkin are the most loved by everyone. Sweet potato and pampoenkoekies (little pumpkin cookies, or fritters) are greatly loved dishes, served with cinnamon sugar or a sweet syrup. After your great main course, you have to enjoy desserts, snacks and drinks, but that will be discussed in the next article. To be a guest in a South African home is a great experience. They pride themselves on hospitality, making sure you are well fed, making you feel at home at all times and creating an everlasting experience you will never, ever forget. During the morning you can chew on some “biltong” which is salty dried meat or “droëwors”, which is dried sausage. You can not watch any rugby or cricket match without this salty snack. By now it is time for more coffee served with banana, ginger of mealie bread, smeared with butter. Mealie bread is a sweet bread, baked with sweet corn. You will probably wonder why we have such an obsession with mealies? Well, mealies basically are Africa’s staple food. We use it to make breakfast, bread, crisps (or chips) and many more. After you finish this, it is time for your main meal of the day. And then the BEST course arrives, the dessert. Most puddings are baked pies served with custard and ice cream or a special sauce. Malva pudding is one of the old time favourites, a great, sweet tasting spongy apricot dessert with a lovely sweet sauce. Cottage pudding is a type of cake pudding served with a special white wine sauce. If you prefer a colder dessert, this is the place to be. Enjoy a fresh fruit salad with ice cream, made from local seasonal fruit. The most famous fruits are grapes, apples, naartjies (a type of tangerine), peaches, apricots, mangoes, melons and many more. There is nothing more refreshing than a fresh fruit salad. If you like ice cream, there are special treats in store for you as well. Try the watermelon or papaya flavoured ice cream in a cone or on its own. As a special treat, why not try a Dom Pedro? This is ice cream with a little drop of milk and a shot of your favourite whiskey of liqueur. 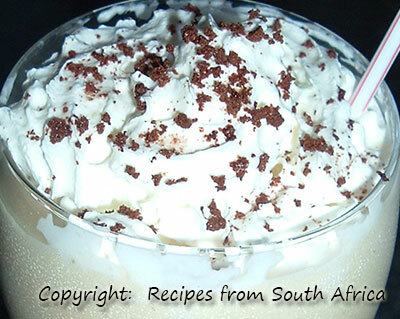 Try Amarula liqueur, made from the potent marula fruit or van der Hum liqueur, made from fresh naartjies. This is a treat you should not pass on. Later the afternoon you can enjoy some “koeksisters”, a very sweet delicacy. Afrikaans “koeksisters” are twisted pastries, deep fried and then sweetened with a very sweet sauce. Another favourite of mine is “ystervarkies”, a sponge cake, dunked in a home made chocolate sauce, rolled in coconut! Doesn’t that just sound magnificent? If you prefer something less sweet, try the “melktert” (milk tart). This is a milk-based tart, absolutely gorgeous if you eat it warm, just as it is made. If you want something savoury, try the “souttert” (savoury tart) consisting mostly of vienna sausages, cheese, onions, herbs and egg. For the evening you can enjoy one the best known foods, “vetkoek”. This is a treat. You can enjoy “vetkoek” in three ways. Dunk it in your tea, butter with syrup and cheese or stuffed with curry mince. No matter which one you choose, you will not be disappointed. If you are looking for something smaller, try the“plaatkoekies” (almost like crumpets) served with marmite or syrup or maybe try some pancakes with cinnamon sugar? During the day you will never go thirsty. If you like warm drinks, there are the many varieties of strong coffees, regular tea, “rooibos” tea, hot chocolate and my favourite, milo. This is a great drink filled with vitamins and minerals, made with warm or cold milk. If you prefer cold drinks, try the various ice teas and fruit juices. Guava, orange, grinadella, fruit cocktail, grape, peach, pear, apple, apricot and mango are only a few choices you have in fruit juices. Guava and mango must be two of the most loved choices. If you are looking for a bottle of wine to accompany you meals, there are hundreds of local Cape wines to choose from. You will be spoilt for choice. Make sure you try as much as you can and enjoy the hospitality while you are visiting the rainbow country, South Africa. These are only a few of the great traditional South African recipes you can try. You will need a long time to try them all. Enjoy!